Where I teach (in the San Francisco Bay Area) we are in the thick of CMEA festival season. I have fond memories of attending district and state festival as a band student in Michigan and appreciate the value of a non-competitive event to get feedback on where we are at as a program. Festival is not the end-all of our objectives for the year but is a useful metric we use to guide our instruction. Every state runs festival differently. CMEA Bay Section doesn’t ask us to choose from a required repertoire list or to perform a march (though we do plenty.) But we must program art music and stay within 25 minutes of time. Also, there are different classes we can place our ensembles in (our 3 developing bands are Class 2, the 2 wind ensembles are Class 3). And we have a sight-reading component. As both a judge and a participating band director in festivals I thought it might be helpful to share a few of my thoughts and observations on tips for a smooth and successful experience at festival. Have a plan. Type it out, write it up, but have a plan. If you have 30 minutes know that 5 minutes of that time will be entering and exiting the room. Another 5 minutes will be transitions and getting settled so really you have 20 minutes for warm-up. Ideally you would practice your exact festival warm-up in the 1-2 rehearsals prior to festival so there is no surprise for the students. I like to do a short breathing sequence and then 2-3 of our warm-up activities followed by repertoire specific exercises they already have in rotation. I suggest having 2-3 items to spot check in each piece but have them be areas that don’t need last minute rehearsing if you can avoid that (I’ve been there, too…) Spot check in reverse order so the last thing they play in warm-up is from the first piece they will play on stage. After the spot checking we tune. Think of the warm-up room as the place where you connect to one another and the music you are about to make. I try to stay cool, calm and collected as I think that energy is a helpful transfer for students who may be nervous, distracted, excited or any variety of emotions. Oh, and did I mention: have a plan! In an earlier blog I shared the curriculum I’ve built to create music literacy beyond a superior rating at festival. For the purposes of this post I will share some different strategies I use with my groups in the 5 minute prep time we are given in the actual sight-reading room. Whether you are a new or veteran band director I hope these offer you some ideas, reminders or points of consideration to help your festival experience run smoothly! Take care and good skill! The quick and dirty? I love lesson planning. It brings some front loaded calm to the anticipated craziness of any given work week. And what teacher doesn’t appreciate some calm in whatever form they can get it? I am unabashedly aware that I have a lot of steps in getting ready for my day. Specific shampoo for thicker hair, face scrub for shinier skin, shaving gel, toner, under eye cream, moisturizer…and we haven’t even gotten to styling products. There is a routine we all follow, big or small, in maintaining a level of hygiene. It is the daily rhythm of how we stay clean and publicly presentable. Could there be a parallel to our ensembles? One of my many favorite parts about teaching is the discovery process that comes through questions, dialogue, and answers in a classroom. It is discussion, in this collaborative learning environment, where I feel the reach of understanding in a palpable way. Because questions provide the framework for exploration, not just regurgitation. But in large ensemble classes I can feel overwhelmed to acknowledge as many students in the conversation as I would like. So I’ve been working on this. A lot. Here are some things I’ve discovered. Wait time. Be willing to walk around the room and give students a chance to reflect on their answer and to unpack their baggage around if it is OK and safe to raise their hand to begin with. I have gotten very comfortable with 30 to 45 second periods of silence while the kids snicker and giggle waiting for someone to talk. Raise an obvious question that will lead to an obvious answer. There’s a place for some low hanging fruit now and again. I just own it by saying exactly that. “Alright, coming your way. An obvious question with an obvious answer…” And these seemingly obvious questions also give some of my more timid students an opportunity to feel like they can participate. A soft lob in the direction of a student who doesn’t always engage in conversation will help to build their confidence. Make sure your questions are specific in scope and framed ahead of time when possible. Give the students every chance to succeed and participate by setting them up to form opinions ahead of the actual dialogue. I try to avoid asking questions with the end goal being my appeasement. I really want to know what they know. And I overtly state that guesses are welcome and wrong answers are OK. Wrong answers are simply a chance for us to understand new things. An opportunity for growth. Good old-fashioned “think-pair-share.” Give the students a prompt and ask them to take 30 seconds to discuss with the person next to them. Then go around the room and have students share what their partner discussed. Then they are simply reporters. Be ready to support a student who gives an answer that doesn’t quite land correctly. You might be ready to offer a lifeline so that another student can step in to assist. If your read is that the student is comfortable, then you could walk them through possible solutions to get to a different answer. I find that when I ask opinion questions I have to frame them very specifically as such. By opening the door to the possibility that we could disagree and have different ideas there is a tendency to have more active participation. Sometimes the “wrong answer” is an opportunity disguised as a mistake. What would happen if you went off script when a student took something in a direction that you didn’t plan for? Some of my most exciting moments have been the moments where I had to punt and figure out a new direction based on the information I was dealing with in real time. The final thought I want to share is that it is critical that you are willing to reframe a question if it seems like the dialogue is falling a little flat. Often times students know more than they are able to provide because the question is unclear. It is up to me to know if my questioning is clear and is leading the discussion in a direction that is helpful. As a teacher I must be willing to continually flex and adapt in order to get a true understanding of what my students are learning under my care. 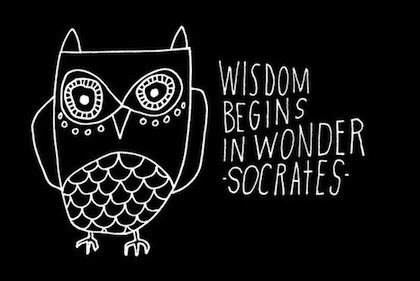 Socrates was on to something.